About the fire over Constantinople, it was not intense but the first bursts were very accurate. At 11,000 ft. the first fire was just off our left wing; about six or eight bursts. Immediately we took violent evasive action which we continued until out of range. Naturally, this fouled up computations to the extent that the following bursts were inaccurate. As I recalled the time delay over Rumania, we circled about two hours at 30,000 ft. waiting for daylight, which delay consumed our fuel to the extent that we knew when we made that decision we would be forced to land in Turkey. This decision was made only because Col. Kraw had briefed us leaving us with the impression that we would not be held in Turkey as Internees. We even landed at the field he advised us to use Sorry I have no further information on Col. Kraw. I talked with Fred Nesbitt about the above explanation and he remembers this about as I have outlined it. Living conditions in Ankara Were not bad for the average Turk, but for us they seemed pretty bad. June, July and August we lived in a school building along with nine Russians and an R. A. F. pilot from Southern Rhodesia. This was located in Ciflic Park near Ankara. A guard and a guard interpreter of the Turkish Army lived there with us. There we were allowed out daily with the guards and went to Ankara with guards in small groups of eight to ten about every two weeks. Food was our biggest problem. Turks don't eat our kind of food and vice versa. We all dieted with the greatest of ease. Practically all of us had Malaria while we lived in this school. In September we moved to Ankara to the Aksehir Hotel. where we were confined to the hotel except for a weekly visit to the city at which time we took advantage of our guards and ducked into a famous restaurant “off limits” to enlisted Turkish Military personnel. We usually spent the rest; of the day there where we enjoyed an excellent Western meal. The remainder of the week we lived on eggs and toast which we finally persuaded the hotel manager to allow us to prepare ourselves. In November the nine of us Who flew out of Turkey moved to Eski Sehir, a Military base; southwest of Ankara. Being a graduate engineer, I was engineering officer in charge of getting the four B-24' s ready to fly. 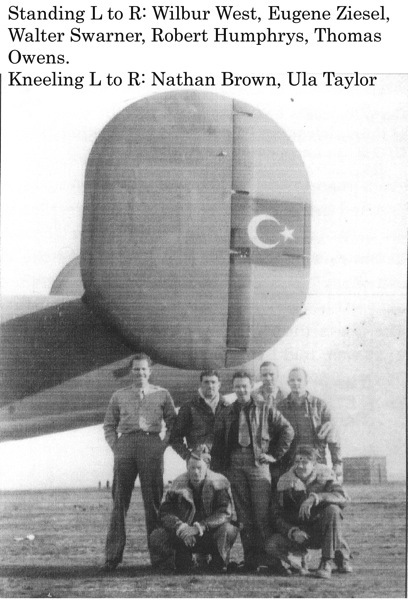 They had been given to Turkey through Lend - Lease agreement, (we flew the B-24's from Ankara to Eski Sehir accompained by Turkish pilots),) and were to teach the Turks to fly them. Close examination of the airplanes found #2 (Brown's airplane) in best condition to get ready first. Sgt's Taylor and Briscoe and myself were allowed liberal access to the B-24’s. Turkish tools and mechanics. The three of us worked on the airplanes daily making minor repairs and transferring gasoline from the other ships to #2. I had a silk escape map of the area (Turkey and Cyprus) and talked over the possibility of escape with the others. Most of them thought I was kidding, but Briscoe, Taylor and myself continued to prepare the airplane for the 400 mile trip. When we finally got about 400 gallons of fuel in the ship, we thought we were ready to go. The weather was beautiful, but only one mag was working on #1 engine. We had no Mae Wests, no parachutes, no guns, no radio, no alcohol in the compass, remote compass out, so we decided to repair the Mag on #1 before leaving. Because of the poor food available, we always skipped lunch and, as was our custom, we worked through the lunch hour. We had run the engines several times on the ship without attracting any unusual attention, so with repair of the left mag on #1, which I did myself, we decided we were ready to go. I had talked this over with an R. A. F. pilot who had been loaned to the Turks and was stationed at Eski Sehir, and he adviscd me of the proper approach corridor to the Is and of Cyprus. I then told the others of our plan for the following day December 11, 1942. Everyone took all his personel belongings he could put in his pockets to the field the following morning. At noon Taylor and I began to start the engines, and one by one the others came out to the ship and boarded it. Just as we were about to close the bomb bay doors, a Turkish mechanic stuck his head in the bomb bay. Quick thinking Sgt. Taylor sent him after a wrench, closed the doors and we gave the engine full throttle from the ramp at the end of the hanger. I had stepped the distance across the sod field to the runway and figured we would clear the ground just as we crossed the runway. Being December, the ground was frozen hard and it was no problem getting airborn as calculated. The one guard ,with rifle in hand, standing in rear of #4 engine, disappeared in a cloud of dust from the ramp. Lt. Brown and I flew the airplane. We stayed just above ground level until a few minutes out of the area and began to climb to get over the 11,00 ft. mountains between us and the Mediterranean. Lt. H. P. Humphrey of Marfa, Texas used the silk escape map I had been able to hang on to and a thumb nail sized compass I also had kept, to do a perfect job of navigating us to Cyprus. When we leveled off at 11,000 ft. reduced power and leaned the engines as far as we could without over heating, our gas gauges all read “O.” When we had been flying about 1-1/2 hrs., and before we could see land, #4 engine fuel pressure dropped and it stopped. Just as we feathered it, Spitfires from Cyprus appeared on the scene and made some close passes at us as if they were about to close in for the kill. Boys in the waist opened the waist window to motion we were friends. (We had Turkish Insignia on the airplanes.) With no radio contact we decided to put the airplane in the water before we would allow them to shoot us down. As we started our descent. Humphrey sighted land, so we lowered our landing gear indicating our intentions to land. On three low powered engines our airspeed with the gear down was only about 140. We knew we would have to ignore the proper corridors to enter Cyprus and we crossed the North coast just west of Nicosia. In a few minutes we sighted the airfield there. Ignoring traffic we landed straight ahead on the runway nearest our heading. The nose wheel shimmy damper was dry, and on landing the nose wheel turned and blew out the nose wheel tire. We abandoned the ship in the middle of the runway there. One of the fellows took a picture of it while a British Lorry was coming out to pick us up. When we told them our story they cheered us with "Good Show," gave us tea and crumpets, and arranged us a ride on the mail carrying Blenheim to Lydda in Palestine that same afternoon. Only seven could go. Two enlisted men spent the night on Cyprus. The next day we took another Blenheim to Cairo. Names of the R.A.F. pilots, I do not have. In Cairo we reported to Bg. 9th. A.F. and were interrogated by Gen. Andrews and Gen. V. H. Strahm. Gen. Andrews was convinced we would have to be sent back to Turkey to maintain good relations but Gen. Strahm went to work and kept us out. We learned that day December l7, that Capt’s Nesbitt and L. H. Smith were to arrive in Cairo in a couple of days, with R..A.F. pilot Hill. British underground had arranged their escape. Except for threats of sending us back to Turkey, we were welcomed back to the old outfit by officers of 9th. A.F. Hg. and given two weeks leave in Cairo, where we celebrated (for two weeks) our return to duty.